Ezi-action® Drumpumps are the best hand drum pump in Europe and the UK. They are the most dependable manual dispensing system for barrels and bulk containers. The Ezi-action® Drumpump has been designed to make a workplace safer and more efficient. Click on the titles below for more information. 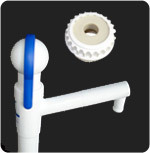 Two fingers on the ergonomically designed ball handle is all the energy required for hand pumping and fluid transfer. 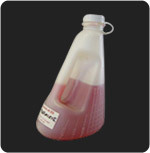 Pumps viscous fluids up to 8,800 cps including oils, lubricants, molasses, and moisturisers. Easy performance throughout the lifetime of this totally plastic pump. Revolutionary, patented double action pumping principle. No critical wearing parts to wear or break. Fast, continuous flow. high volume, low pressure. Reaches to the base of drum or container and empties all the contents. Prevents waste with swivel spout and no leaking. Manufactured in New Zealand from NZ sourced components and in USA from NZ and USA sourced components. Only fully serviceable hand pump in the world. 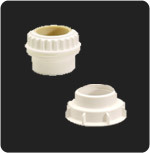 Provides years of reliable dispensing. Serviceability is appreciated by responsible businesses and highly valued by end users. Reduce risk of chemical mix-ups. Differentiate to acid or alkali chemicals with colour. Made from FDA compliant, superior quality polypropylene and LDPE plastic, Ezi-action® Drum Pumps have a very broad chemical resistance: including mild solvents. 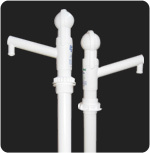 Acid resistant, caustic resistant, and resistant to chlorine based chemicals. Pumps liquid foods: including water, milk, olive oils, acetic acids, sauces, food colouring, honey, and molasses. Manufactured under strict conditions by parent company in New Zealand that assures your liquids will not be contaminated during pumping. Learn more about all the chemicals being dispensed with Ezi-action® Drumpumps. Effective safety strap secures the handle and the contents. Safety Strap provides enhanced safety when children are around a dairy shed. Safety Strap prevents access by unauthorised people. Prevents workplace accidents with no excessive bending to pour contents. No problems of spillages or leaking of liquids. 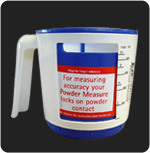 Enclosed dispensing via our optional Ezi-action® Safety Measure makes dangerous chemical transfer safer. Optional coloured safety straps for product differentiation and controlling cross contamination. 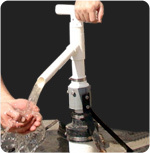 Ezi-action® Drum Pumps can siphon if a long hose is attached to the standard straight spout. Siphoning can be completely prevented with the Ezi-action® Non-Siphon Check Valve fitted to a hose. Contact us to buy direct. Contact us to learn of a stockist closest to you.